As you may recall in my Influenster Spring VoxBox I received the Broadway brand imPress press on nail manicure for review. My first challenge was the color, I received the bright and I mean bright pink shade shown in the picture above. The nails were shiny as promised by the Broadway brand but I decided early on that since pink isn't my color I would paint over the pink color. I haven't done this yet since I don't have to leave my home today, but I will do it before going to work tomorrow. I thought the mock nail polish bottled used to house the nails was a cute idea. 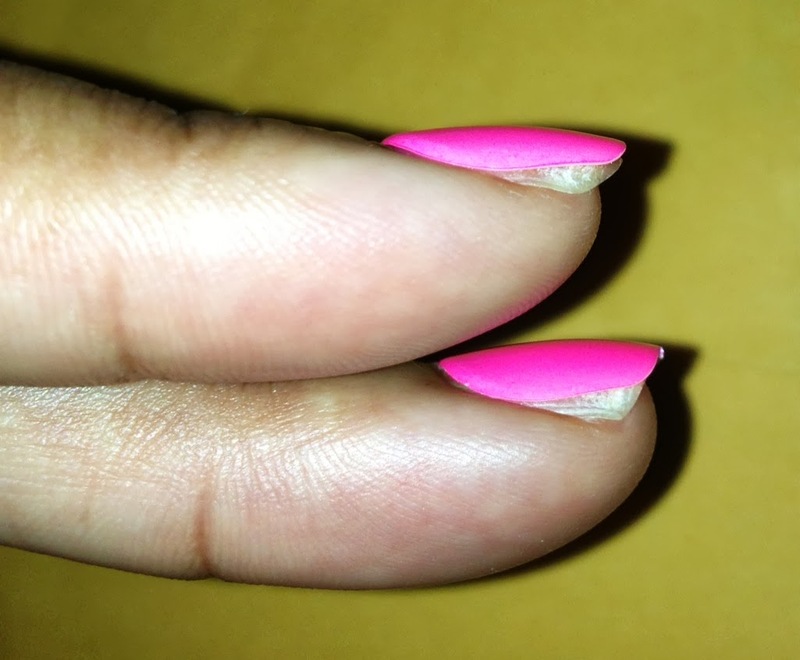 I applied the nails easily by removing the sticky tab and simply pressing the fake nails on top of my nail. It was nice to see how easily the nails were able to adhere to my natural nail. The most difficult part was finding nails that fit well on top of my nail. 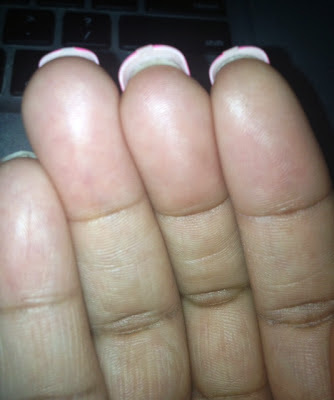 In this area I think this product failed, I don't think I have large fingers at all, yet they aren't too small either, I would consider my finger size and nail bed area to be average. Surprisingly though I had portions of my real nail peeking out from this fake nail. The instructions encourage you to go with a smaller nail rather than a bigger nail if you can't find your exact size and that's what I did. I suppose using a bigger size would have allowed for more gapping making it easier for the nails to fall off. After getting the nails on I went to sleep totally expecting the nails to have popped off by morning but they were completely in tact. I also have to mention that the nails were short so I appreciated that because my natural nails are not very long so I was comfortable with the length. This product is supposed to come with 24 nails, I received 23, no kidding, I even counted several times. At any rate some people have been able to get two applications out of this product, which for the price wouldn't be so bad if only I could find my correct size. The product retails for $5.99 for colored nails and $7.99 for patterned nails. 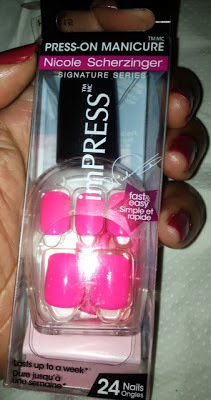 I will update this post as the week progresses to let you know exactly how long this product lasts on my nails. 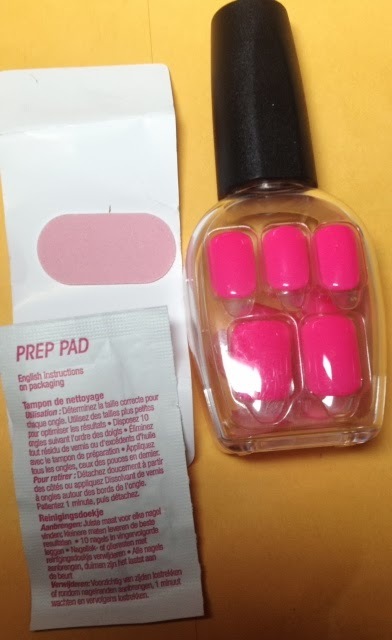 If you are used to or like fake nails then you may want to use this easy on the go system. However, I didn't find enough nails that fit my fingers and there was also this oddly shaped extra piece of plastic at the tip of the nail which made it convenient to snag on just about anything. Perhaps you can make our that extra square, raised piece at the tip of each nail, if so, that's the snaggy section. This definitely wasn't my cup of tea but if you have worn these nails, please feel free to share your experience. UPDATE- these nails are hanging strong with no sign of letting go. They were applied on Sunday night, I washed my hair on Monday and still these nails have stayed put. I am writing this update on Wednesday evening and I think I can actually make it through the work week with these nails. At least regarding the staying power, these babies are tough! I was given these nails to try and had the same problem as you. My hands and nails are really small so, I thought it was really odd that all the nails were too small. I had to read the package again because I thought maybe they sent me kids nails, lol. These are a def. fail for me too! LOL @ checking for kids nails. I know this is an older review but i have to comment too. Mysweetie924, thanks so much for your feedback. They really need to make an adjustment in this area...LOL @ handing them off to a friend with smaller hands..lol. 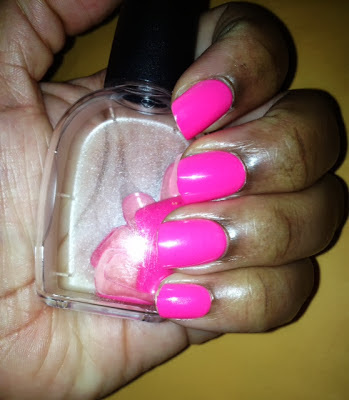 Did Sally Hansen Nail it?